Get comfortable sitting in a chair, feet on the floor, close your eyes, and relax. Now, bring your attention to you body, noticing how it feels; Is there any tightness, gripping, numbness, pain or agitation anywhere in your body? Take a deep breath, and notice the base of your spine, which is your 1st chakra. The 1st chakra is where you will create a “grounding cord”. When you make a grounded connection to the Earth, it stabilizes your body, and allows you to release pent up energy back to the planet. Mentally, see and feel a bright spot of energy at your 1st chakra. 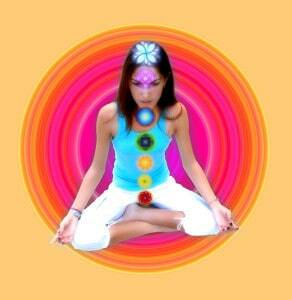 Notice what happens to your body when you say hello to your 1st chakra, notice how it feels. Next, notice the planet- send a hello deep down into the center of the Earth. Notice how your body feels to acknowledge the center of the planet. Next, you will create a grounding cord – imagine a picture you’d like to use; it could be a beam of light, a waterfall, a tree, an umbilical cord, a rope. Feel the bright spot of energy at the base of your spine, and send another hello to the center of the planet. Now, step back mentally, and connect your 1st chakra with the center of the planet using your image. Send your grounding cord deep down into the center of the planet. Notice what happens to your body when you connect the two points – does your body release energy? Do you feel yourself coming back, deeper into yourself? Do you feel more solid? More relaxed? Take a deep breath, and consciously decide to release energy – just let go of your day, your job, your responsibilities, at least for now, and allow yourself to connect with your body. Release any pent up energy, any pain, stiffness, tension or blockages from anywhere in your body down through your grounding cord. How does it feel to release energy? Notice your body, and use your grounding cord to release and relax. Notice if you’re tight or tense anywhere- these are points where you may be carrying foreign energy- we can pick up energy from other people, from places and situations, and store it in our bodies. Say hello to them, and let go- don’t force or push the energy out, just let it drop out. Release all the foreign energy point by point, letting it fall through your body and down your grounding cord, back to the center of the Earth. When all of the negative energies are released, and you feel very relaxed, you’ll need to replenish your energy- but you don’t want to replace it with the same energy you just released!. Instead, imagine a golden sun above your head, and call back your own energy from where ever you left it- at work, with other people, wherever. Make your sun big and bright, and let it flow through the top of your head and into all the places you’ve released. Let it flow through your entire body, filling up your feet, your hands, your fingers. If you want, make another sun. When you’re full, take a deep breath, open your eyes, stretch, and enjoy the feeling of being grounded. Special Discount, only available through this Energy Meditation Class! Download the MP3 and video instructional package, for Meditation Class 1. It is enhanced with sound therapy techniques to deepen your meditation experience.